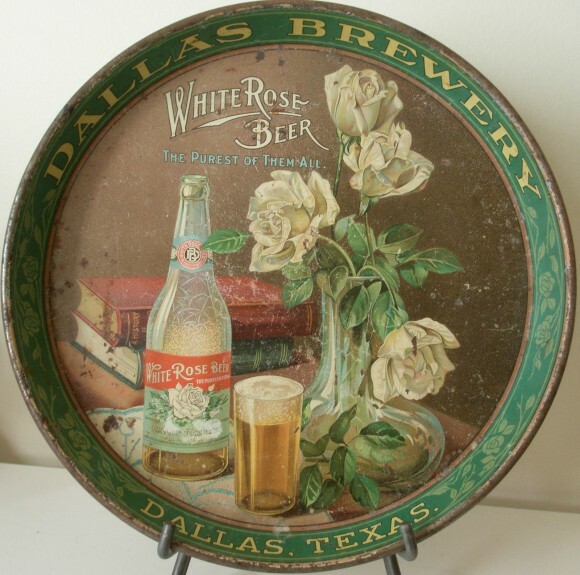 Serving Tray for White Rose Beer, The Purest of Them All, from the Dallas Brewery. The center of this tray has a wonderful painting of a counter top showing two books, a vase holding white roses, and a glass and bottles containing the company’s beer. This 12″ round tray dates to the 1900s and was manufactured by Haufman & Strauss New York, NY. This is a rare tray that can bring nice prices even with minor condition issues so please contact us for an appraisal or offer.